Our Improver learn to swim lessons are for children who have completed 75 metres back and breast stroke and their Water Confidence Two award. These formal style lessons are about introducing head down front crawl, breast stroke and aquatic breathing techniques, improving all round swimming ability and water confidence. Our instructors, teaching from within the water are on hand to offer support and guidance. Children learning to swim at Improver level at Wirksworth, continue to follow our own learn to swim programme. Your child can follow their progress on a wall chart and on completion, thanks to local businesses, receive a reward package worth around £40. This package currently consists of an adult and child ticket for The Northern Light Cinema in Wirksworth, an adult and child ticket to Matlock Farm Park and a climbing experience at Alter Rock in Derby. Your children will also receive a photo keepsake and appear on the ‘Wall of Honour’ at the pool. Swim 100 metres alternating between breast stroke and back crawl. Change stroke at the end of a length only using pool walls to touch and turn. Back Crawl Proficiency: show good points of style and technique consistently over a distance of 30 metres. Breast Stroke Proficiency: show good points of style and technique consistently over a distance of 30 metres. Swim – 150 metres alternating between front crawl, back crawl and breast stroke, completing a minimum of 50 metres in each stroke. Change strokes – at the end of a length only, using poolside to touch and turn. Front Crawl Proficiency: show good points of style and technique consistently over a distance of 30 metres. Sculling– for 5 metres continuously head first and then feet first with the feet at or near the surface and turn 360 degrees in a tuck position. Treading Water– in an upright position for 60 seconds unaided. Floats/Glides– Perform a mushroom float holding position for 5 seconds. Push and glide from the poolside on the front and back holding a glide position for 5 seconds. 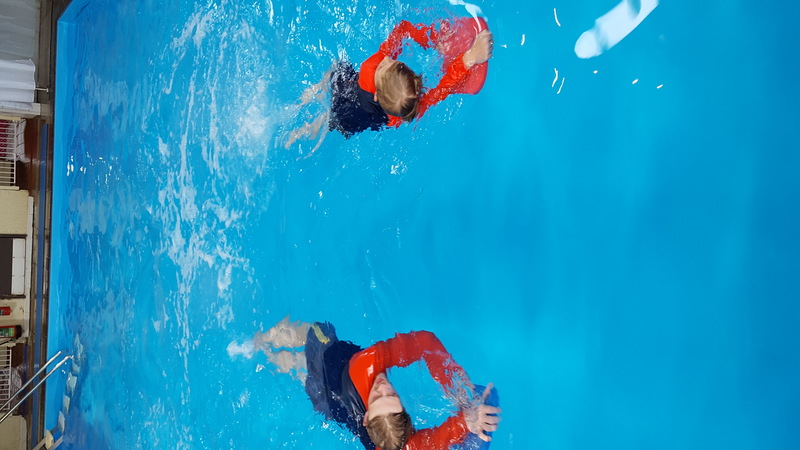 Underwater Skills – Perform a surface dive and swim 5 metres underwater. Water Safety: Answer one of a possible five water safety questions. "The children are kind and there are very good teachers." "We travel to Wirksworth pool from Ripley for swimming lessons and speaking with other parents/carers – they too travel many miles to use the wonderful facilities. Wirksworth - you are very fortunate to have such a fantastic pool."